What is Montessori? Or perhaps, more properly, who is Montessori? 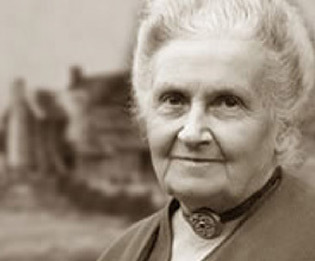 Maria Montessori (1870-1952) was an Italian physician, then an educator. Her first school opened in 1900, and now, the Montessori educational method is used in public and private schools throughout the world. The Montessori Method emphasises hands-on, individualised learning. Montessori's discoveries about the process of learning, revolutionised education; much of the developmental, 'hands-on' approach now widely used in preschools and kindergartens, can be traced back to her original 'innovations' through observation. Montessori observed children had an innate self-drive to learn about the world around them. She found they learned best when they could choose to learn within a safe, hands-on, and child-centred learning environment. Maria used self-correcting puzzles and other learning tools to help encourage independent learning, and she found children worked best and would help teach each other, if they were put into groups with children of varying ages (about a 3-year range). She defined Four Stages of Development, which correspond to the current school system. Each stage has particular characteristics. The environment, activities, and programmes vary accordingly. The children are given freedom to choose from a wide range of specially-designed activities, which help them to acquire concepts, knowledge, and skills. Montessori also observed children thrived when given an opportunity to learn real-life, applicable skills and knowledge, appropriate to their age. Teenagers, she wrote, did best when the primary emphasis of their learning was action-oriented, rather than based in abstract studies. She believed psychological and physiological pressures teenagers were under, made it hard for them to focus on purely intellectual pursuits. Montessori's greatest discovery - and what she believed to be the most significant - was this: it is most important not that the students pay attention to the teacher, but that the teacher pays close attention to the students. Montessori felt that by paying close attention to the students, and responding to what they need with personalised lessons and materials, teachers could help their students fulfil their greatest individual potential. In New Zealand, there have been Montessori schools since 1920, with a considerable upsurge of interest since the 1970’s. Interest and commitment to Montessori education, as a choice for parents, has continued to grow. We now have many Montessori services throughout New Zealand.